Conrad Richter suggests we should keep the Middle Path option open, even though it has failed in our negotiations with China. But we have other options. It is good to consider various option, but sooner than later we must choose one option only and stick to it. Leaving various options open will not carry any weight either with China or with the free world. It will simply drown in the sea of discussions and perish in the ocean of Chinese lies. One option is not to negotiate with China as long as she is a communist country under dictatorial rule. After all, we have been stung before by the wily snake. In the meantime, we should urge Tibetans in Tibet to speak only Tibetan, eat only Tibetan food, wear only Tibetan clothes and buy only from Tibetans. We, outside Tibet, must prodigiously carry our message of freedom to the free world and practice a policy of non-cooperation with China, while at the same time employing Mahatma Gandhi's civil disobedience tactics, such as blocking trucks delivering Chinese goods to stores like Walmart and Target, stopping Chinese officials from entering their embassies, consulates and the U.N. building, liberally painting streets and public walls with Free Tibet slogans, hoisting Free Tibet signs and Tibetan National flags on bridges and next to Chinese flags, and hacking communist Chinese computers. 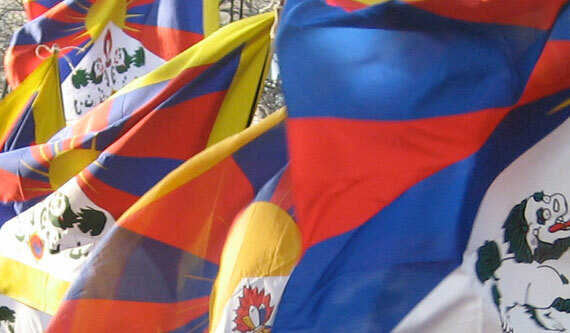 Moreover, as I said at a rally in Vancouver, Canada, in 1996, we must establish a Tibetan Friendship Corp to provide food for the poor and hungry and clean the streets of dilapidated neighborhood so that those citizens will join our demonstrations and vote in our favor on critical issues.